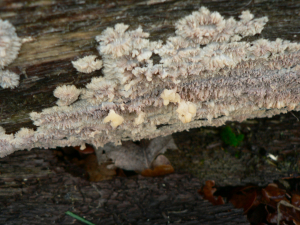 Observation - Unknown fungus on dead oak branch - UK and Ireland. Description: Slightly pinkish fungus growing on eastern aspect of a large branch that had dropped from a veteran oak about 3 years ago. Any idea of ID? Are they both the same type? Slightly pinkish fungus growing on eastern aspect of a large branch that had dropped from a veteran oak about 3 years ago. Any idea of ID? Are they both the same type?